These are so cute. I like how the color of the food matches that character that it goes with so well. My favorite is the Yuugi and Yami one. 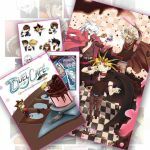 It's funny how Yuugi got frosting on his head Yami doesn't seem to care. Nice work.